Our mechanical tachometer Deumo measures quickly and smoothly speed and rotational speed up to 50,000 rpm. Furthermore our mechanical tachometer works according to the turbulent flow principle. Due to additional equipment that is easy to attach at the top of the mechanical tachometer, various types of drive are feasible. The measurement is irrespective of the agitator direction of measured subject since a reversing gear is integrated in that mechanical tachometer. The device is equipped with a three-level shifting-gear. By simply pushing a button, the pointer can be locked on the current value. A mechanical tachometer of the Deumo type is multi-sided applicable. It can be applied anywhere, where short-term measurements by a tachometer is to perform. Furthermore our mechanical tachometer Deumo is designed for application in areas of maintenance. The mechanical tachometer works mechanical, so it can be applied everywhere, even if there is no power source. Apart from this a mechanical tachometer of type Deumo operates efficient and eco-friendly, since f a disposal of the battery or example is not necessarily required. The accuracy of the measured data values is very definite, despite of autonomy of the rotating direction as described above. Our mechanical tachometer Deumo is very simple to handle due to the well arranged and legible scale and less key buttons making a handling quick and simple. The device is preserved in a plastic enclosure and by that kept safe. 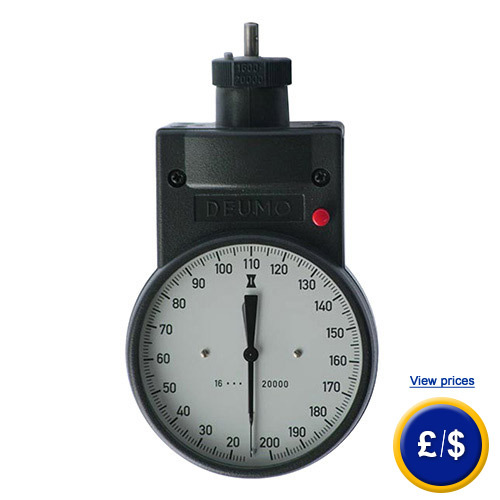 If there are any questions about this mechanical tachometer from the Deumo series, please have a look at the technical specification below or call: UK customers +44(0) 23 809 870 30 / US customers +1-410-387-7703. Our technicians and engineers will gladly advise you in all tachometers and all products in the field of measuring instruments, regulation and control and scales.